It just did not get cold enough for many manatee visits to the park today. The river temp was 70° F (21° C). Cassie and Buckeye, the new releases, were in the spring boil. Then, 17 minutes after the manatee count was over, a small fat juvenile came in at the river. That’s it. Big grass carp today, koi yesterday. Exotics we wish would go away. We tried, but the river temp was only down to 71° F (21.5° C), and no manatees were in except for Cassie and Buckeye, the recent releases. They are going out in the river to eat but not going far. They are not here for the cold but just hanging out. We will try again tomorrow. I have been out of energy from a cold and nothing much to report as well. It appears the last day of the manatee season was my last blog update on March 29th. Regular morning appearances by manatees stopped at that time. However, Buckeye and Cassie, the two manatees released in March, are around a bit. Cora Berchem, Save the Manatee Club Manatee Researcher, was called out to check a high floating manatee at Sanford on Lake Monroe recently. Observers said the manatee had been floating high for three days and all the alarm bells went off. A simple gas problem resolves in 24 hours, but we had three high floaters this season that exceeded that, and one of them died. The Florida Fish and Wildlife Conservation Commission coordinated a successful rescue. The manatee is now at SeaWorld Orlando and treatment is ongoing. Cool next week, maybe a manatee or two will drop by. On the 28th, the river temperature was up two degrees to 70° F (21° C), and we had two more manatees instead of less. In a way, it was the same, as our tagged manatees were testing the river yesterday and came in as soon as the count was over. Today we saw them in the river as we took the river temp and counted them first. So in the end, the count was 17 manatees. On the 29th, the river temp remained at 70° F, but only two manatees were counted by Cora Berchem, our Multimedia Specialist. Cora has a new title in addition to the old, Manatee Researcher, and I will use it from now on. Among all these manatees, none were Save the Manatee Club adoptables. The river temperature was 68° F (20° C). We counted 15 manatees. Yesterday Cora Berchem, Save the Manatee Club’s Multimedia Specialist, counted 19 manatees. Later in the day, Gator was seen on the webcam. Today he showed up late again, but he brought Annie with him. SeaWorld reports the emaciated manatee captured recently is eating. That is a good sign, and treatment is ongoing. The river temperature dropped to 64° F (18° C). Cora Berchem, Save the Manatee Club’s Multimedia Specialist, counted 160 manatees. Among the 82 manatees she ID’d were the following Club adoptable manatees: Gator, Howie, Lucille, Philip, Lily, Aqua, Annie, and Phyllis. The river temperature remained the same, 65° F (18.5° C). Cora Berchem, our Multimedia Specialist, counted 73 manatees. Of those, 38 manatees were ID’d in windy conditions that made it hard. The Save the Manatee Club adoptable manatees in were Gator, Howie, Philip, Annie, Lily, and Lucille with her calf. The poor emaciated girl we were looking for came in and was captured along with a juvenile near her in case it was her calf. She was taken to SeaWorld Orlando for treatment. Hopefully she can be restored to health and returned. Thanks to Florida Fish and Wildlife Conservation Commission, Blue Spring State Park, Save the Manatee Club, and Volusia County staff and volunteers for their help. The river temperature was two degrees lower than yesterday at 65° F (18.5° C), but there were half the number of manatees at 12. Manatees love to ruin my predictions. None of the manatees present were Save the Manatee Club (SMC) adoptables, nor was the one we want to help there. It looks like the warmest air temp will be 68° F (20° C), so the river should cool even more tonight. Perhaps Cora Berchem, SMC’s Multimedia Specialist, will have better luck tomorrow than I did today. The river temperature remained at 67° F (19.5° C), but perhaps the manatees know it will be cooler for a couple of days soon because the count increased from nine manatees yesterday to 24 today. Only eight were ID’d today as it was very windy. None of the manatees ID’d were SMC adoptees. Tomorrow looks bad as well, but I intend to go out in case our emaciated manatee comes in. The river temperature was 65° F (18.5° C). I counted 202 manatees and ID’d 188 of them. Among them, I saw the Save the Manatee Club adoptees Howie, Lily, Paddy Doyle, Brutus, Nick, Annie, Gator, Phyllis, and Philip. Most of our males were part of a group chasing Lemon in circles around the run — Lemon being a female. The river temp today was 66° F (18.8° C). We counted 102 manatees and ID’d 85. The Save the Manatee Club adoptable manatees in were Brutus, Annie, Howie, Gator, and Rocket. Then the wind came up, and we had to give up waiting to see more late arrivals. Rocket visits! The surprise of the day was to find Rocket present in the run for the first time this season. We have known where he was, but it was great to see him home. Philip and Gator were the other two Save the Manatee Club adoptees present. Our river temp was 67° F (19.5° C). That must have been raised by the nearness of the spring water. Only 61 manatees showed up for the count and 52 were ID’d. It was a little windy or we would have stayed on the water longer. It was adoptee city for the Save the Manatee Club adoptable manatees on Saturday. Aqua, Lucille, Nick, Howie, Philip, Doc, Annie, and Brutus were in. Gator even showed up in the afternoon. I counted 93 manatees for roll call and ID’d 82. The river temperature was 64° F (18° C). As I took roll, Melody Fischer of Sea to Shore Alliance retagged Buckeye with the tag Cora Berchem, our Multimedia Specialist, found in the river on an evening boat outing. The tags are designed to break off if caught on something, and Buckeye must have thought that just over 24 hours of being tagged was enough. The tags will be removed once the captive-raised orphans prove they can survive out in the world. Cora was also on hand to lend assistance with the retagging. On Sunday, Cora was assisting a retagging of Cassie, another just-released manatee at the park, and was able to do a roll call. Cora found 69 manatees and ID’d 41 of those. The Save the Manatee Club adoptees present were Brutus, Lucille, Philip, Gator, and Doc. The river temperature could not be taken from the bank today as the wind was pushing the spring water south where it interfered with the water thermometers. However, with the air temps in the mid-thirties, we had 70 manatees for the count! Of those, 64 manatees were identified. It was good to see Brutus again today, but I had hoped more than Floyd would have joined him from the Save the Manatee Club adoptees. Looking forward to tomorrow. Brutus was in!!! The river temp was still 68° F (20° C), but Cora Berchem, the Club’s Multimedia Specialist, counted 24 manatees. Of those, 19 manatees were ID’d, including Brutus, Lucille and her calf, and Philip. Buckeye and Cassie, rescued as orphans in 2015, were fitted with satellite tags and released today to join the party. The river was up one degree to 68° F (20° C), and there was half the number of manatees — seven. It was a very warm night. I hope for better tomorrow. The river temp had gone down one degree, and we had one more manatee on the count to make 14. The river is at 67° F (19.5° C). Six of the manatees present were different than the ones that visited yesterday. Only nine were ID’d, and none of those were Save The Manatee Club adoptees. On Sunday, the river was 70° F (21° C), and there were no manatees. Today the river temp was 68° F (20° C), and I saw 13 manatees for the count. Eleven were ID’d. Eight were cow/calf pairs, and none of the manatees were Save the Manatee Club adoptees. Should be more tomorrow. zero. The river temperature today was 74° F (23° C). Too warm, too warm! Maybe by Monday. Summer in winter continues here in Florida with highs in the mid-80s and lows in the mid-60s — no cold, no manatees. There is some cooler weather predicted starting next Sunday. In the meantime, here are some preliminary numbers for the season: 562 manatees were seen at least once during the season, previous record 509. We had 62 calves, previous record 56. Manatees returned from last season: 295. Manatees returned from seasons prior to last season: 20. These are also records. We had some fairly severe cold, but outside of that, the manatees continued to travel, so we saw many. I will be interested to see how many manatees can be considered to have stayed the winter. Our highest daily count ever was 485 manatees. A manatee roll call was done on Monday and had one thing in common with today’s count: no manatees. The river temp was 74° F (23.5° C). This seemed a little high until we saw the dark river water intruding into the spring run on the surface. This means the river water was warmer than the spring water and therefore lighter and floating on top of the heavier colder spring water. As the spring water is just over 72.5° F (22.5° C), it all fit together. Cora Berchem, the Club’s Multimedia Specialist, managed a roll call the day after Valentine’s Day. The river temp was 71° F (21.5° C). She counted four manatees and only one could be ID’d. That manatee was not a Save the Manatee Club adoptee. We hope for another cold wave. Yesterday the river temp was 72° F (22° C), and today it was 71° F (21.5° C). Yesterday we had no manatees, and today we had two — juveniles that were not even recognizable. Channel 6 came out and did a follow up on the new research canoe that arrived Monday and was all fixed up with letters and decals yesterday. It is great. Thanks to all those who were able to contribute! The river temp was 70° F (21° C), and the manatee count was zero. I could not even find a trace of the 18 manatees the park staff counted yesterday. When the manatees and algae-eating fish leave, the white sandy bottom begins to “brown over” with algae. So if the manatees sleep, they leave nose and tail prints on the bottom. If they move, they often leave flipper drags in the sand. The predicted cool weather is moving further away, but I cannot believe the season is over. The river temperature was up four degrees to 68° F (20° C) today. The manatee count was up from 14 to 40. This is backwards, as there should have been about seven! Oh well, the manatees know best. I ID’d 19 manatees, none of whom were Save the Manatee Club adoptees. We even hung around for a while hoping one would show up! The river temperature was 64° F (18° C). I counted 14 manatees and ID’d 8. The only Save the Manatee Club adoptee I saw was Philip, who did me the favor to come in just as I was about to put the canoe away. The BBC filming has wound up but without that one alligator/manatee shot they had tried so hard for. They did get a lot of good footage. The river temperature was 62.5° F (17° C) and with it so much warmer I was surprised to count 144 manatees. The park staff even counted 182, but they counted much earlier. I ID’d 78 manatees, but Lucille, along with her calf, was the only Save the Manatee Club adoptee visiting. The BBC alligator filming continues. One alligator watched us put out cameras in his regular hang outs, decided we were up to no good, and left. The other alligator was in an area with no manatees and no tree limbs to put cameras on. Later in the day I watched him swim out of the run as if he was late for an important date. As we went, I counted 145 manatees and ID’d 63 of them. Save the Manatee Club adoptees Philip, Aqua, Gator, Doc, and Paddy Doyle were in. The river temp was 61° F (16° C). Channel 13 came out to film my roll call today, and their program is due to air on February 12th. The river temp was 59° F (15° C). I counted 149 manatees and ID’d 90. 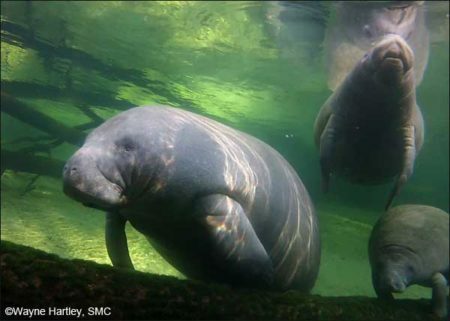 The Save the Manatee Club adoptees in were Phyllis and Lily. Then, late in the day, Gator the manatee swam in front of the alligator the BBC was filming. It was kind of a fun day. Another manatee named Gael came in for the first time this season and one named Rodney dropped in. Rodney was born from the Blue Spring population but stays in a refuge to the north. If the season goes on long enough, I will see every manatee in the St Johns River! As I attempted to help the BBC film alligators on Wednesday, Cora Berchem, the Club’s Multimedia Specialist, did a count. Cora counted 247 manatees after recording a river temp of 60° F (15° C). She ID’d 113 manatees and saw Save the Manatee Club adoptees Annie, Howie, Lucille, Floyd, and Lily. On Thursday, I took the day off. That means I stayed home and worked for eight hours on choosing a canoe (thank you to everyone who donated! ), writing blogs, reviewing film of the manatees, etc. So Cora Berchem did the count again. The river was 59° F (14.5° C). Cora counted 237 manatees and the park staff counted 237. Among the 128 manatees Cora ID’d on Thursday were the following Save the Manatee Club adoptees: Phyllis, Lenny, Nick, Floyd, Lily, and Whiskers. The BBC film folks have gone back to Crystal River for the day. River temperatures are up but about to go back down, so the manatee are conflicted. There were 90 manatees yesterday and 116 today, and the park staff counts are in close agreement. Club adoptee Nick was in yesterday, and Lily was in today. We are helping the BBC film a documentary. But we are spending a lot of time staring at alligators hiding under the bank. They are staring back at us, refusing to come out to be filmed. On Saturday, the weather looked grey, but “faired” off. The river temp was 61° F (16° C). I counted 249 manatees and ID’d 122 before the wind picked up. The park staff counted 247 manatees. The Save the Manatee Club adoptees present were Gator, who was all excited about something, Philip, Deep Dent, Doc, Howie, Lenny, Nick, Phyllis, Paddy Doyle, and Floyd. On Sunday, the terrible weather forecast eased off, and the manatee count went perfectly. The river temp was the same as Saturday, 61° F (16° C), but the air temp was rising, so about 100 fewer manatees were counted. I counted 140 manatees and the park staff counted 144 manatees. I identified 87 manatees, but only two, Annie and Doc, were Save the Manatee Club adoptees. The wind forecast was 5 to 15 mph and gusts to 25. But I needed to go. I was lucky. The wind started after I had seen the majority of the manatees, when I was about a quarter of the way up the run. On the way back down, the wind was steady at 19 mph, and I hugged the bank and just tried to get to the beach! No, I do not have a wind gauge, but the St. Johns River Cruises does. The river temp was 59° F (15° C). I counted 276 manatees and ID’d 128. The park staff counted over 300 manatees, but they were interrupted by a “manatee panic.” Humans can cause them, but manatees also do it to themselves. A playing manatee gets shoved against a sharp log, for example, or something produces an alarm call, and away they go. I knew it had happened as many manatees were returning from the river wearing coats of sand. When panics happen, the manatees throw sand up in the water, and it settles on their backs. As this happened just before I started, my count was lower. It makes IDing hard as well as the sand covers many ID scars. The Save the Manatee Club adoptees that I saw in today were Howie, Philip, Deep Dent, Doc, Paddy Doyle, Phyllis, and Gator. The river temp was up to 61° F (15.5° C) and the count of manatees was down accordingly. I counted 147 manatees and ID’d 74 of those. Save the Manatee Club adoptees Howie, Lucille, and Gator were among them. As the river warms up, the first manatees out into the river are the big, scarred ones. I am left looking at young, hardly scarred manatees that I cannot ID. There are more of those all the time, and that is good. The research canoe was stolen over the weekend. They took out a big section of the stairs to the canoe beach, where the canoe was secured, to get it loose. We will have to use the aluminum canoe that belongs to the U.S. Geological Survey for awhile. After the fiberglass canoe, it feels very tippy. The river temp was 57° F (14° C) today and warming fast. I counted 205 manatees and ID’d 127 of those. The Save the Manatee Club adoptees in this morning were Howie, Lucille, Lenny, Doc, Floyd, Phyllis, Deep Dent, and Gator. Then I was told that while I was making my way back down the run after the count, that Nick and Paddy Doyle were seen on the webcam. The river temp was 55° F (12.5° C). We counted 408 manatees and identified 291 of those. This may have been a record day for IDing! In terms of Save the Manatee Club adoptees, we saw Annie, Aqua, Doc, Lily, Lucille with calf, Nick, Howie, Deep Dent, Paddy Doyle, Floyd, Philip, Phyllis, Margarito, and Whiskers. The river temp was 52° F (11° C). As cold as I was in 26° F (-3° C) air, that did not seem right, but the river comes from the south where it is warmer. I counted 419 manatees and ID’d 175 of them. I saw Howie, Nick, Annie, Gator, Lenny, Paddy Doyle, Phyllis, Whiskers, Deep Dent, and Aqua among the Save the Manatee Club adoptees. I keep mentioning that manatees are still coming in for the season for their first visit. Today it was a manatee named Roos. Several times I thought Roos was in, and when I would check the pictures it would be another manatee. Today, when I checked the pictures, I found it really was Roos! Making the manatee ID’s was hard today with the wind coming all the way up the run and frequently pushing me against the bank. The ripples distorted the scars, and I was afraid of being blown onto a manatee that did not expect it, but all went well. The river temp was 57° F (13.5° C) today. We counted 316 manatees and ID’d 179 of them. Among those sighted were Howie, Nick, Lenny, Lily, Floyd, Annie, Whiskers, and Phyllis. The river temp was 58° F (14° C). I had a member of the media with me, so my count was rather loose, but the park counted 314 manatees, and that seems right. I ID’d 165 manatees and saw Save the Manatee Club adoptees Howie, Nick, Doc, Floyd, Lily, Whiskers, Phyllis, and Gator. My companion adopted Phyllis, so that was nice. On the above water webcam, we’ve seen so many film clips of the manatees playing with an old fallen palm tree. Two days ago, a fresh tree fell in the same place, and the manatees are enthusiastic. The river temp was up to 62° F (16.2° C) on Friday the 12th, and so there were fewer manatees in. We counted 188 manatees and ID’d 83. Unfortunately, none of the Save the Manatee Club adoptees were in attendance. But the cold is coming back, and this next week should be something! On Monday, the river temp was 55° F (13° C), and there were plenty of manatees. The wind was up, making it hard to count and harder to identify. We finally came up with a count of 480 manatees and ID’d 126 of those. Unlike Friday, we had some adoptees in. We saw Lucille, Paddy Doyle, Howie, Philip, Lily, Floyd, Gator, Phyllis, Whiskers, and Doc. New manatees are still arriving. Cora Berchem, Save the Manatee Club Multimedia Specialist, did the count alone again today. The river temp was 58° F (14° C) and 235 manatees were in. Cora ID’d 103 manatees and saw Annie, Howie, Lily, Gator, Floyd, Philip, and Whiskers. The first week of January, Florida Fish and Wildlife Conservation Commission staff photographed Millie, BS133, at Port Everglades. The last time we saw her was at Blue Spring in November 2014. Ah Florida! On Friday, I was dressed in long johns, two T-shirts, a heavy knit sweater, a heavy knit muffler almost as big as a sweater, a field jacket, a floatation device zipped up to keep out cold, and mittens. On Monday, I was wearing two T-shirts and the floatation device buckled but unzipped to keep cool. The river temp today was 54° F (12° C). We counted 354 manatees and the park staff counted 359. With 191 manatees ID’d, we saw Lucille and her calf, Lenny, Howie, Floyd, Doc, Gator, Lily, Whiskers, and Phyllis. A research note would be that a manatee named Nu was seen at Silver Spring on New Year’s Day. Nu was at Blue Spring two years ago for a day or two and made it into a YouTube video appearance earlier in Silver River, but I did not pick up on the ID then. The river remains at 50° F (10° C). My count was 426 manatees. Among the 237 manatees I ID’d were these Save the Manatee Club adoptees: Lenny, Nick, Floyd, Annie, Deep Dent, Philip, Doc, Gator, Paddy Doyle, Phyllis, and Whiskers. On Saturday, the river temp came up 50° F (10° C). We doubted the thermometer on that one, but it was still quite cold for a manatee. This was our synoptic survey day, when we participate in an attempt to count every manatee in Florida in a two or three-day period. I was sidelined and so Cora Berchem, Save the Manatee Club’s Multimedia Specialist, had to go it alone. She did very well indeed. Cora counted 485 manatees and 53 of those were calves. The highest count made at the park to date! Cora ID’d 167 manatees and saw the following adoptees; Nick, Lucille, Annie, Deep Dent, Philip, Lily, Floyd, Whiskers, Phyllis, Doc, Aqua, and Paddy Doyle. On Sunday, I determined that the river temp of the last two days, 50° F (10° C), was correct. The water comes from the south where it can be much warmer. Cora did the count again on Sunday. She counted 446 manatees, and the park staff counted 441 — not bad. Cora ID’d 169 manatees, including Nick, Lucille, Philip, Howie, Lenny, Deep Dent, Margarito, Lily, Gator, Floyd, Whiskers, Doc, Aqua, Phyllis, and Paddy Doyle who was late again for roll call. The river temp is down to 48° F (9° C).The park staff counted 391 manatees, and Cora Berchem, Save the Manatee Club’s Multimedia Specialist, and I counted 453 manatees and ID’d 209. The adoptees in that number were Deep Dent, Lucille with calf, Howie, Lily, Floyd, Margarito, Aqua, Phyllis, Whiskers, Doc, Paddy Doyle, and Philip. There have been higher counts at the park, but I believe this is my highest! The river was 51° F (10.5° C). Needless to say, many manatees were in. Cora Berchem, Save the Manatee Club’s (SMC) Multimedia Specialist, did a count of 418 manatees after the park staff count of 363. The wind made things very difficult, but Cora ID’d 124 manatees. SMC adoptees Lily. Gator, Floyd, Aqua, Phyllis, Doc, Whiskers, and Philip were definitely seen, and there may have been others. Deep Dent is back! To greet him were Annie, Nick, Lenny, Lucille, Howie, Paddy Doyle, Floyd, and Philip. The river was 62° F (16.5° C). The run was so stirred up with clay and silt on Saturday that Cora Berchem, Multimedia Specialist for Save the Manatee Club (SMC), deferred to the park staff count of 347 manatees rather than the 253 she counted. On Sunday the 31st, the river temp was 60° F (15.5° C). Cora did the manatee roll call again on that day and counted 354 manatees with much clay suspended in the water to hide them. The park staff counted 364 manatees before the clay was so stirred up. Among the 136 manatees Cora ID’d were SMC adoptees Lucille, Paddy Doyle, Howie, Nick, Margarito, Aqua, Deep Dent, Phyllis, Doc, and Philip. The last two manatees were not seen during roll call, but after. The river was down to 64° F (17.8° C) and the weather was miserable and getting worse. The park staff counted 385 manatees, and I counted 327. Of those, I identified 171 manatees. The second one I ID’d was Howie! Then I saw Lucille, Annie, Floyd, Paddy Doyle, Whiskers, and Aqua. Many more than Howie made their first roll call of the season today. I was glad I came in spite of the weather. Cora Berchem, our Multimedia Specialist, did the count. Cora counted 257 manatees and ID’d 102. Aqua was seen leaving the run between the taking of the river temperature (it was still 66° F (18.8° C), and launching the canoe, but Aqua counts. Also seen during the count were Annie, Lucille and calf, and Whiskers. Nick showed up too late for roll call, but he showed! The river temp remained the same at 66° F (18.8° C). But it was a damp cool that seems to bother the manatees as it does us. So today we counted 190 manatees and ID‘d 127 of those. At 10:55 a.m. with the count over since 10:04 a.m., Lucille and calf came in. Especially nice since we were doing a livestream on our Facebook page! At least we had one adoptee. The river temp today was 65° F (18.8°C). I counted 148 manatees with more coming in. The badly injured juvenile female manatee we are monitoring is behaving normally and shows signs of healing, so we are continuing to monitor. Still with no adoptees. Our Multimedia Specialist, Cora Berchem, counted on Saturday through Christmas Day. On Saturday, the river was 65° F (18.5° ) and 67 manatees were in. Of those, 32 were ID’d. On Christmas Eve, the river temp was 67° F (19.5° C). Cora counted 63 manatees and the park staff counted 64. On Christmas Day, the river temp was 66° F (19° C). Cora counted 80 manatees and the park staff counted 77. No adoptees were present on these three days. The river was at 66° F (18.8° C). We counted 99 manatees and ID’d 82. None were adoptees. The river went down a degree to 65° F (18.5° C). Cora Berchem, Save the Manatee Club’s Multimedia Specialist, counted 113 manatees. She ID’d 52 manatees, but none were adoptees. Good news: the situation with our high floating cow resolved itself, and she appears to be okay now. Good thing too as we had a big-time capture scheduled for her today. There’s other news about Una and her calf, Mr. Baby, released on December 12th. Una behaved as if she hadn’t been away. Mr. Baby did not leave the run until yesterday. But today he was found out in the feeding grounds eating and socializing with other animals. We counted 109 manatees today, and the park staff counted 107. The river temperature was up to 65° F (18.5° C). Of those counted, 58 manatees were ID’d, but there were no adoptees present. We have 55 calves for sure, but there may be six others and more to come. I have decided Amber did not bring her April first calf in. Well, she had at least eight months to nurse it and then wean it. But it does not get on the season count though! Yesterday, one of my unknowns got into the clear water while the wind was down and turned out to be Venetia. She was a rehab manatee released last year, and we all hoped she would be back! Only half the manatees today with a river temp of 66° F (18.8° C). We counted 147 and the park staff counted 148. Conditions were good, so 84 of the manatees were ID’d. The sole adoptee present was Philip. The river temp was 64° F (17.5° C). It is warming up. Soon it will be summer again in winter. I counted 278 manatees in a flat calm and less silt. I ID’d 149 manatees and saw Lucille, Annie, Lenny, and late boy Philip. With the clearer water, I filmed my heart out! Cora Berchem, Save the Manatee Club’s Multimedia Specialist, did a count today. She counted 264 manatees with a river temp of 65° F (18° C). Philip, Paddy Doyle, Floyd, Gator, Doc, Phyllis, and Whiskers were among the manatees ID’d. Our orphan seems to be settling in, but now we have a new one. It doesn’t look as fit as the first, so we shall be watching it. On Thursday, Cora Berchem, the Club’s Multimedia Specialist, did a count. The river was 58° F (14° C). She counted 304 manatees and the park staff counted 314. Of the manatees counted, Cora ID’d 108 of them and found Lucille, Philip, Gator, Doc, and Phyllis. Later, with the count finished, she discovered Lenny. We have been notified that Brutus is warm and comfy in another spring. On Friday, the river was at 59° F (14.5° C). We counted 335 manatees and the park staff counted 321. I love it when we are close that way. Of those, 158 manatees were ID’d. First, we greeted Nick for the first time this season and then saw Lucille, Gator, Paddy Doyle, and Annie. It looks like our floater is getting closer to help. A boat, nets, people, and a place to go for treatment may soon be available. The river was down to 58° F (14° C). The wind and silt were better but still bad. The better visibility was shown as I counted 344 manatees and ID’d 178. Paddy Doyle, Doc, Flash, Lily, and Phyllis were in. All were in the upper half of the run above the aluminum dock. Philip made his first appearance this season by swimming in during the count. Una and her yearling were in but far apart. If they had stayed in the wild, Una would have weaned him long ago. Our female floater is not looking better. The river went up a degree and a half to 61.5° F (16.5° C), but we counted 261 manatees again. Conditions were worse with wind and silted water. We ID’d 121 manatees. Margarito was the first adoptee ID’d, and it was his first day this season. Then we saw Phyllis, Gator, Doc, Paddy Doyle, and Annie. Una is home from SeaWorld with her yearling. The release went well. Mr. Baby, the yearling, is tagged, so we have two tagged manatees now. The other tagged manatee is Randall, and he is learning to come to the warm water of Blue Spring quite well. Our male floater is unseen for now, but we continue to watch for him. How we will handle the female and her calf is still under consideration. More calves and other manatees are coming in. The river was 60° F (15.5° C). Steam was coming off the run as we counted 261 manatees. There must have been many more, but they are still so happy at meeting old friends that they are still churning up the clay and silt as they cavort together, making counting more than challenging! Of those, 131 manatees were ID’d. The adoptees in order sighted were Lily, Lucille, Floyd, Paddy Doyle, Doc, Flash, Whiskers, Gator, Phyllis, Lenny, and Merlin! As for our two floaters; the gentleman (manatee) from Rivera Beach was not seen. Hopefully that means he has recovered, but we want to see him to be sure. The female with calf was still floating high, and we continue to watch her. At the start of the day, I had seen 248 manatees this season. I think I need to do some more figuring. There are 48 calves now. Amber is in, but we cannot say we have seen her calf (born before the season started) yet. FLOYD IS BACK! With that out of the way, the river temp was 60° F (16° C). We counted 145 manatees under very poor conditions. The wind was up and the run was silted up by cavorting manatees. Many more must have been in. Of those, 80 manatees were ID’d. As well as Floyd, Lucille and calf, and Annie were in from the adoptees. There have been 248 manatees seen so far this season. I look forward to the next few days as many old acquaintances will be coming in. Yesterday a manatee that made his first appearance at the park on December 8th was floating high. He was reported, and we were asked to keep an eye on him. Today he was very close to normal. Cora Berchem, Save the Manatee Club’s Multimedia Specialist, sent pictures to the USGS Sirenia Project, and he was ID’d as Rivera Beach654. RB654 was ID’d in 2009 and last seen in 2010. Another manatee was floating very high today, and we hope she improves tomorrow as Unknown 28 (RB654) has. It was cool and drippy yesterday. The river temperature dropped a degree to 68° F (20° C). The manatees knew it and probably know it is getting even cooler. We saw 45 today. And for that matter, we are up to 45 calves seen this season. Annie came in to get on the count, so we even had an adoptee! Where are so many others? I hope by the end of next week we will know. Winter is coming! The past three days, the park staff counted 12, 11 and 5+ manatees. Today the river temp was 69° F (20.5° C). I counted 12 manatees, and the park staff counted 10. I had six unmarked juveniles, three poorly marked juveniles, one poorly marked adult, and two named and numbered Blue Spring manatees. Because I have missed days and cold weather is coming, I shall try again tomorrow in spite of the weather forecast. Saturday looks really awful, but Sunday may be perfect. The river temp remained at 68° F (20° C), which was surprising. Cora Berchem, the Club’s Multimedia Specialist, and I counted 38 manatees and ID’d 26 on that Friday. None were adoptees. Cora was also able to count on Saturday and get some observations on Sunday. The manatee count on Saturday was 20, and though the count was up to 23 on Sunday, the temp was also up to 69° F (19.5° C). Of those, 19 manatees were ID’d, but none were adoptees. Winter is coming, I think. The river was 68° F (20° C) again today. Also again today, the manatees had the clay in the lower run stirred up. I counted 57 manatees and ID’d 37. Seven manatees were ID’d after some of the clay settled. No adoptees made the roll call, but Gator came in late. We have been informed that Galadriel died of a natural gut upset that was probably bacterial. The river temp is up to 68° F (20° C), and the manatee count is down to 80. Of those, 54 were ID’d, and Gator was among them! Calves seen during the season are up to 42. I should have mentioned Randall yesterday. He was released near Satsuma, Florida, in the St. Johns River, and when the cold arrived, he did not get that he needed to move to a warm water source. So staff and volunteers from the Florida Fish and Wildlife Conservation Commission, Sea to Shore Alliance, SeaWorld Orlando, Save the Manatee Club, and Blue Spring State Park went and got him. Randall has been at the park for a few days now, and he definitely seems to get it now. He goes out, feeds, and comes back to the warm spring. Now a new problem. A young mother with a young calf has a line entanglement. I saw this in the film I shot to get her new boat scar. Calves and pregnancies complicate things when it comes to rescues. The river temp was 65° F (18.5° C). We counted 98 manatees today, but it should have been more. At the start, the clay was badly stirred up in the lower part of the run. Then the manatees did a panic (perhaps one manatee shoved another against a sharp tree branch in the water). At that, we moved up beyond the clay and counted from there, estimating we missed 16 manatees, but it was probably more. The research depends on manatee recognition, and the count is almost incidental. We ID’d 65 manatees but again no adoptees. The run was very clear when we came back down from the boil. Cora Berchem, the Club’s Multimedia Specialist, and I also did a livestream to the Club’s Facebook site during the roll call. We are up to 40 calves seen this season and 204 manatees total. Every season now, with so many manatees coming in, we seem to have an orphan or two. This year we have one nicknamed “Brown Calf.” She is very small, and we finally realized she was all about the run by herself and became concerned. I got film of her belly (to see if she is malnourished), and she looks good. Then Cora filmed her nursing, and today she was keeping close company with two other manatees. She will probably be fine, but we will keep an eye on her. We are also looking forward to the return of Una and calf, Mr. Baby, from Sea World where Una was treated for line entanglement on both flippers. The river temp was 64.5° F (18° C). We counted 101 manatees and ID’d 68, but there were no adoptees present. Thirty-six calves have been seen for sure. We are still waiting to see if two of the mothers have calves or are just borrowing little ones. The third mother we were wondering about proved to us she does indeed have a calf. It just does not like to hang around with mom. We are also waiting for Amber to bring her calf in for the season. Amber brought it in off and on all summer, so we are getting a little impatient. After the count, we bid farewell to Galadriel as the Florida Fish and Wildlife Conservation Commission recovery team came to pick her up. We should know the cause of her death soon. November 25th: The river in Palatka at Racy Point was 65° F (18.4° C), but it was 68° F (20° C) at Blue Spring, which is why I cannot use Racy Point to determine the water temp at the park. I counted 66 manatees, and the park staff counted 65. I ID’d 49 manatees, none of whom were adoptees. We have at least 33 calves is so far. Our total manatees seen is 158. November 26th: Yesterday a manatee named Galadriel was floating high as they often do with gas. It was her first appearance this season. I asked the rangers to call if she was still having buoyancy problems today. Instead, we were notified this afternoon that a dead manatee had been brought in to the park. We ID’d it as BS344 Galadriel. Galadriel was ID’d very young in 2002. She brought in calves in 2005, 2012, 2014, and 2016. IDing the dead manatees is the saddest part of this work. The cause of Galadriel’s death will have to be determined. On a lighter note. Cora Berchem, Save the Manatee Club’s Multimedia Specialist, was able to do a count today. The river temp was 66° F (19° C) and 91 manatees were in. Of those, 39 were ID’d and Lucille was among that number with her calf. Racy Point in Palatka and Blue Spring both had a river temp of 66° F (19° C). If it would be consistent, it would make my job easier, and I could just get the temp from the Internet at Racy Point. I counted 77 manatees, but there were many more in the clay the manatees were stirring up on the west side of almost half the run. There are more calves in and more manatees in for their first visit of the season. Yesterday, while I stayed home, a manatee released two weeks ago was captured and brought to Blue Spring to help him learn about warm water sites. He seems to appreciate being here. Of the manatees counted, there were 47 ID’d, and only Lily and Lucille among the adoptees in today. The weather looked too bad to count, so I stayed home and worked on numbers. We have seen 109 different manatee at a minimum. We have at least 24 calves. The returned adoptees are Lily, Lucille, Annie, Phyllis, and Gator. Today the river was down to 64° F (18° C), and we had a count of 43 manatees. Of those, 30 manatees were ID’d. There was hardly anyone new, and the only adoptees were Lucille and Lily. The weather ahead looks very bad for manatee roll calls! Rain and more rain. The river temperature came in as 66.2° F (19.1° C), so we were up to 38 manatees for the count. Of those, 21 were ID’d. Lily and Lucille were in. Twenty-three calves have been seen, and there are three adult “maybes” that might have calves or have been borrowing little ones. Getting better and better! Cora Berchem our Multi-Media Specialist did a count today. She also did one on November 11th. On the 11th, she counted three manatees then ID’d a non-adoptee after the count was over. The river was 70° F (21° C). Since then, the park has averaged around five manatees a day. Today the river was 68° F (20° C), and the manatee count was 26. Cora ID’d several manatees with more to follow as we look at her film. Lucille and her calf were in! Looking at the forecast for Orange City and knowing it is often cooler (or hotter) at the park, I was, and am, planning on counting tomorrow and Monday. After Saturday, the rest of the month looks like manatee weather. The river temp was 68° F (20° C.). I was surprised it was so low, but the manatees seem to know the air temps will be in the 80s (and was yesterday), as only 11 were in. Six manatees were ID’d, but none were adoptees. I shall be keeping an eye on the webcam and the thermometer. Cora Berchem, our Multimedia Specialist, did the count today. The river temp was up to 70° F (21° C). She counted 10 manatees and the park staff counted nine. Cora ID’d nine manatees, and one of them was Gator — the sole adoptee. River temp of 67° F (19.5° C) today. I counted 44 manatees, and the park staff counted 32. I have an advantage most days by being in a canoe. Of those, 36 manatees were ID’d, and the only adoptee was Gator. We are up to 15 calves and are waiting for four we saw pre-season to show up. The season began on October 31st. Now I expect to see the numbers of manatees drop to near zero as the warm weather returns for an extended period. P.S. Just got a look at a still from a film Cora Berchem, the Club’s Multimedia Specialist, shot on Tuesday, and Annie is pregnant! Today we counted 39 manatees and the park staff counted 31. Given the high opaque water, that is much the same count. The river was 69.5° F (20.9° C). For those who do not know, a river temp of 68° F (20° C) gets the manatees coming in, and the lower the river temp gets below that, the more manatees we see. Of the 34 manatees ID’d, only one was an adoptee. Gator is back and was all over the run engaging in play with everyone, whether they wanted to play or not. Phyllis showed up later on in the afternoon and was spotted by Cora Berchem, the Club’s Multimedia Specialist. But Phyllis did not have a calf with her. If the season started yesterday, and that will be determined tomorrow, we have seen 10 calves. We are waiting to re-sight four manatees seen during the spring and summer. Lot of calves for two days. Cora Berchem, the Club’s Multimedia Specialist, went out with me today. We got a river temperature of 67.9° F (19.9° C). We saw 54 manatees! So we will go out tomorrow as well. Lucille was in with her calf seen during the summer, and Annie came in as we finished up. Twenty-eight manatees were ID’d. As usual at the start of the season, it is cow/calf pairs and juveniles that tend to show up first. Frustrating, as I have so many I cannot ID. If this is the start of the season, we may have a month without many manatees as the warm weather is predicted to return. It was cool a few days, and I had to be near the park anyway, so at noon I dropped by for a manatee check. The river was 72° F (22.2° C) at Racy Point in Palatka, which is too far from the park, but an indicator. Yesterday 10 manatees were sighted in the spring run at the park. Today I estimate six gathered to watch me recover the canoe from the high water. The park had reported three manatees. The water was too dark to ID any manatees. Later I saw a cow/calf pair nursing near the river but still no luck with an ID. There are 20 number markers along the run on stakes. Only eight number markers were visible where they should be, one was on the bottom, and 10 were missing or not visible due to the high water. I hope to go back out Tuesday. This is the time when manatees drop by the park as the river cools, only to find out it is not cold enough to start the manatee season yet. But they are reassured to find the spring still there at 72° F (22.2° C).